There is no doubt he'll make you smile ! 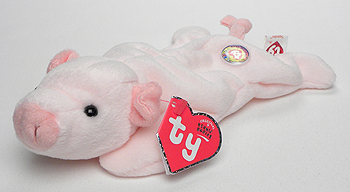 Squealer was one of the original nine Beanie Babies. Chocolate, Flash, Legs, Splash, Squealer, Pinchers, Cubbie, Spot with a spot, light pink Patti or the rarer raspberry Patti. Chocolate, Flash, Legs, Splash, Squealer, Pinchers, Cubbie, light pink Patti, Spot with a spot, or the rarer Spot without a spot. 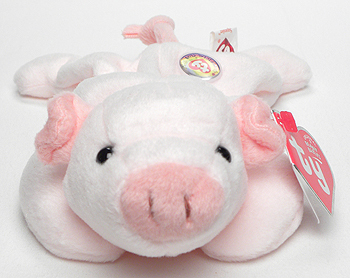 Chocolate, Flash, Legs, Splash, Squealer, Pinchers, Spot with a spot, light pink Patti, Cubbie or the rarer Brownie. Chocolate, Flash, Legs, Splash, Squealer, Cubbie, Spot with a spot, light pink Patti, Pinchers or the rarer Punchers. Chocolate, Flash, Legs, Splash, Squealer, Pinchers, Cubbie, Spot with a spot, light pink Patti or the rarer deep fuchsia Patti.